When it comes to oral hygiene, there’s one question we get asked a lot: is a manual toothbrush just as good as an electric one? The answer is… yes and no. We hate to be complicated, but please just stick with us — your dentist in Temple has the skinny on electric vs. manual toothbrushes in this week’s blog post! Are YOU guilty of the following bad brushing habits? If so, you may need to ditch the manual toothbrush in favor of an electric one. You don’t brush for long enough. For ages, dentists have been encouraging patients of all ages to brush their teeth for two minutes, twice a day. That’s 30 seconds on each quadrant — but reality is, most people will brush for a minute, tops. You brush too hard. 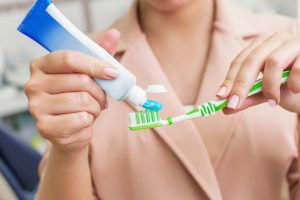 It may feel like you’re getting a really good, squeaky clean when you put a little elbow grease into your toothbrush, but you’re really just putting your gums at risk of injury and gum recession instead. You don’t brush in small, gentle circles. One more key to getting a thorough clean that doesn’t injure your gums is brushing in circular motions. But because it’s easier to brush in back and forth swoops, most people fail to get this part right. In theory, you can get the same clean with a manual toothbrush, but only if you are using it correctly every single time. Most people just don’t. An electric toothbrush takes the work out of brushing your teeth. One of the biggest benefits we see is that they come with an automatic timer — and most people who make the switch are surprised to find that two minutes feels a little longer than they’d ever realized. Going electric can also take some of the pressure off of your teeth and gums. Because the head pulsates or spins on its own, this type of toothbrush does the work for you, reducing the risk that you will brush too aggressively and injure your tooth enamel or gum tissue. Cost: Electric toothbrushes are often far more expensive than manual ones. Size: Some people — like those who travel a lot — prefer the convenience of a smaller, manual toothbrush. But even considering the cost and size of an electric toothbrush compared to a manual one, the oral health benefits usually outweigh these potential disadvantages. So who wins the contest between electric and manual brushes? There’s not really a clear winner, but we’d say an electric toothbrush is usually the better option for most people. But no matter which you choose, the important thing is that you’re brushing (and flossing) regularly! Add these good at-home oral hygiene practices in with regular visits to your dentist and you’ll be smiling happily and healthily for a lifetime to come. Dr. Richard Fossum and Dr. Brooke Elmore provide excellence in family dentistry for Temple friends and neighbors. To learn more about proper tooth brushing habits or to schedule an appointment, we invite you to contact the office at (254) 778-3900.